On Friday 4th October Louise O’Hanlon Account Manager at New Directions Education was invited to attend the Harvest assembly at St Mary’s RC Primary School in Newport. Throughout the week before the assembly pupils bought in a selection of food, which was to be donated to The St Vincent de Paul Society (SVP), which is an international organisation dedicated to tackling poverty and disadvantage by providing assistance to those in need. 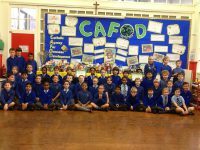 During the Assembly Ms.Watkins Year Five teacher at the school spoke to the children about Catholic Agency for England and Wales CAFOD. CAFOD works with partners across the world, wherever the need is greatest, to bring hope, compassion and solidarity to poor communities, standing side by side with them to end poverty and injustice. Ms. Watkins also read a few stories to the children about families living in Kenya who are struggling and have gone without food, she asked the children to take a moment to think about how they would feel if they were to go to bed without anything to eat. Louise commented on the assembly “The service was very thought provoking and gave the children the opportunity to think about the importance of helping others and sharing what they have”.